Right now there is little incentive to pursue a bachelor’s degree in early childhood education. Degree holders have the lowest starting salary of any major, and there are limited opportunities for career advancement. But research shows the achievement gap begins before students enter kindergarten, and our littlest learners need the best teachers. Many states are exploring ways to professionalize the early childhood workforce, and some are reforming degree and credential requirements. This year, Washington, D.C. passed legislation requiring all early childhood educators to have an associate’s degree. 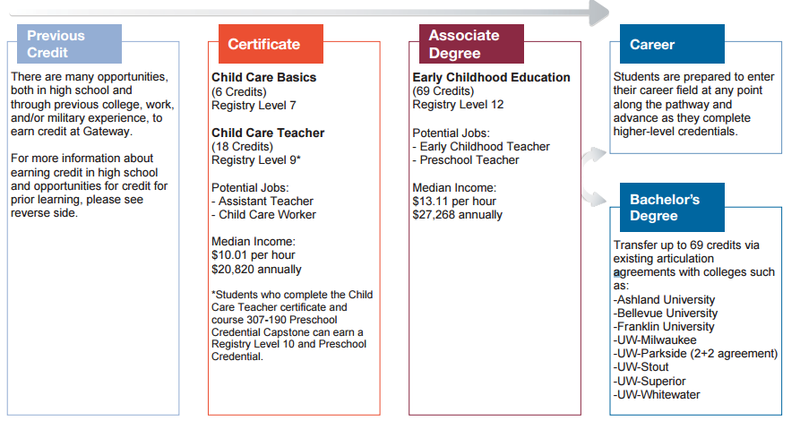 Other states now require a Child Development Associate (CDA) credential. With this trend in mind, states should plan ahead to make early childhood education degree programs worthwhile and accessible for educators already in the field. As it is now, many two-year institutions offer a range of options to study early childhood education: students can take a CDA preparation course or pursue a certificate, diploma, career associate’s degree, or transfer associate’s degree (to continue at a four-year institution). The differences in these programs can be unclear to students and may not align to build on each other. With confusing programs and poor advising, students end up with additional credits that don’t contribute to a degree program, wasting precious time and money. Guided pathways require higher education leaders and faculty to redesign their offerings, creating clear outcomes for programs and credentials that build on one another. As seen below in the career map from a community college in Wisconsin, pathways clarify which degree programs are relevant for which careers and other outcomes and give students increased agency in selecting a program that fits their needs and goals. Articulation agreements are agreements between two- and four-year institutions that allow students to transfer seamlessly without losing credits. Most two-year institutions have some kind of articulation agreement, but not specifically for early childhood education. Expanding the number of early childhood bachelor degree programs at four-year institutions and ensuring every two-year institution has an articulation agreement for early childhood lays the foundation for potentially requiring early childhood educators to have bachelor degrees in the future. Some states, such as Connecticut and Pennsylvania, have already created statewide agreements between all two- and four-year institutions for early childhood degrees, providing a model of what this could look like elsewhere. Early childhood accreditation organizations, such as the National Association for the Education of Young Children (NAEYC), work to raise the quality of early childhood programs. But accreditation can be expensive, and many schools prioritize other programs for accreditation above early childhood. State support, such as North Carolina’s innovative grant program, expands the number of accredited programs. As early childhood educators pursue a degree, the seal of accreditation provides peace of mind to students, as well as a degree program designed to meet the needs of today’s infants and toddlers. If states aren’t already thinking about reforming the early childhood workforce, they are missing an opportunity to professionalize a field that plays a vital role in eliminating the achievement gap. For reform to be successful, institutional structures must be in place to support continuing education. If not planned correctly, the burden of mandated degree policies will rest on teachers and not successfully transform the early childhood education field. This entry was posted in Early Childhood Education and tagged accreditation, articulation, community colleges, early childhood workforce on August 2, 2017 by Lee Foster.